6 lenses per box @ $48.63 per box. Minimum order 2 boxes (six months' supply). 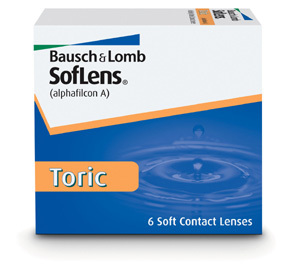 The Soflens Toric uses Bausch & Lomb's patented Lo-Torque design to keep each lens exceptionally stable during wear while its advanced optics corrects astigmatism by refocusing light to a single point for sharp, clear vision. Additionally, its deposit-resistant material aids comfort by preventing protein build-up.